We just completed a custom Performance Model instrument for Jonathan Braun, a good guitarist and old friend from Marin County. He asked me to make very special instrument designed for comfort and ease, a Performance Model guitar, but with a Stand Up style tapered body, an ergonomic arm rest, and a 615 mm string length. The very short 615 string length was the biggest departure for me. I have built guitars a small as 630 mm, and I've also had guitars even shorter, but generally those instruments are smaller body, designed for children or other small people. In this case we were pushing the limit if how- short-can-you-go. The best way I know to discover what a "limit" is, is to pass it. I thought maybe this would be past the limit, but no. This 615 scale concert guitar is really magical. Honestly, the bass, the volume, the trebles and the overall presence are completely acceptable, wonderful actually, with no obvious sacrifice of sound. What is unusual about this guitar is the incredible playability because of the shorter fret spacings, and the a remarkable sustain, kind of supernatural, due I suppose tot the low tension on the top. Whatever it is, the overall affect is very appealing, and it extends the horizon of what's-possible once again. 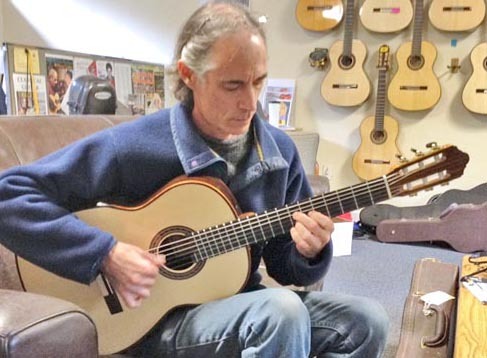 There's nothing like a good old 650 mmm concert classical guitar, but more and more we are finding variations that suit a lot of special desires, needs or curiosities, and sacrifice nothing in the process. Pretty cool. I'm going to make a couple more similar guitars right away, both to test some further variations, and to discern whether the magic of this guitar was a lucky anomaly, or whether it is a reliable formula. Keep in touch. For more special features, check out our Features and Options page.